Key Technological Advances of "Modern" Steam Locomotives"
Ing. Livio Dante Porta in 1971. These technologies were pioneered by Ing. Livio Dante Porta, (1922-2003) an Argentinean mechanical engineer who moved the technology and performance of the steam locomotive farther than any other one person in the 20th Century. At the age of 27, he built his first steam locomotive, “Argentina,” which became the most efficient steam locomotive of the late steam era, more than double the efficiency of a standard US steam locomotive. A close friend of Porta, David Wardale, transformed the South African Railway 4-8-4 #3450 into the SAR Class 26, affectionately referred to by its crew as the "Red Devil" in 1980. He raised the drawbar horsepower (DBHP) from 2,500 to 4,000, a 60 percent increase, and increased its thermal efficiency to approximately double that of the best U.S. steam locomotives, utilizing GPCS, Lempor Exhaust and Porta Water Treatment, while decreasing fuel and maintenance costs substantially. Following in Porta’s footsteps and a colleague of David Wardale’s, Shaun McMahon, CSR Director of Engineering, is an internationally-renowned modern steam locomotive mechanical engineer. Managing the intellectual estate of the Porta Family and working at the Institute of Technology of Argentina in Buenos Aires (INTI), the same institute where Porta worked and developed many of his improvements, McMahon is the ideal candidate to lead engineering modifications to CSR locomotive 3463. CSR's Shaun McMahon at the throttle of RFIRT 2-10-2 locomotive number 107 during an inspection in 2006. There are two technologies that separate modern steam locomotives from traditional locomotives: the implementation of the Gas Producer Combustion System (GPCS) in place of conventional steam locomotive combustion (which works in tandem with a high efficiency exhaust) and the use of a modern and much more effective internal boiler water treatment regime than was available during the US steam era, (PT). These technologies work to improve overall thermal efficiency of modern steam locomotives while at the same time reducing maintenance cost and improving reliability. In fact, PT and GPCS, because of the elimination of the sandblasting effects of unburned fuel particles, leads to the virtual elimination of boiler maintenance, which accounted for 91% of the maintenance cost of the steam locomotive. Chapelon pushed the state of the art in traditional steam locomotives in France, leading the way for Porta and his followers. 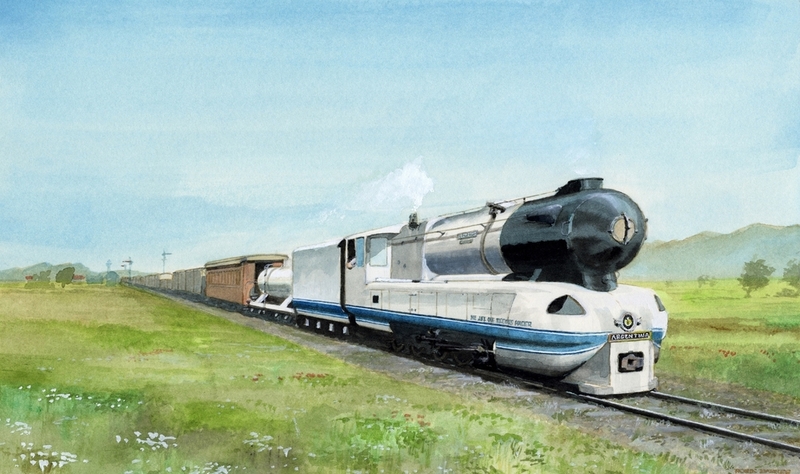 This image shows a six cylinder 2-12-0. 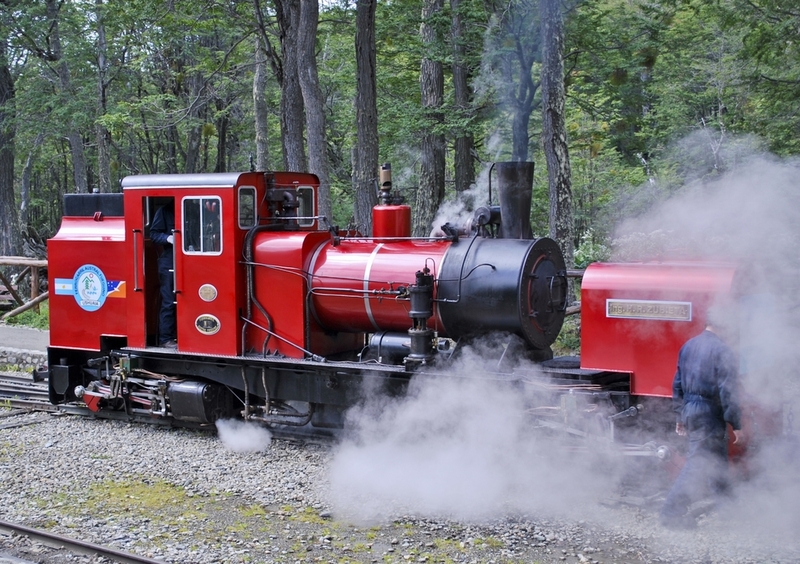 The four-cylinder "Argentina" is the most efficient steam locomotive ever built. Painting: Robin Barnes. While Porta Treatment (PT) works to maintain low maintenance cost and efficient heat transfer within the modern steam locomotive boiler over the lifespan of the locomotive, the Gas Producer Combustion System (GPCS) enhances the fuel combustion system of steam locomotives, increasing the thermal efficiency of the locomotive while decreasing abrasive corrosion present in traditional combustion systems. The drawing below shows a simplified elevation view of a conventional steam locomotive firebox. In this arrangement, most of the air necessary to burn the fuel, about 90%, enters around the ashpan and moves through the grate and fuel, primary air. Only a small amount of air, about 10%, enters the firebox as secondary air, through holes in the firedoor, and sometimes through over-fire jets, which are openings installed in the sides of the firebox. In a conventional combustion firebox/ boiler unburned fuel particles act much like sand-blast media as it flies through the boiler at high speed. This causes erosion on the metal surfaces on the inside of the boiler, including the sheets, tubes, flues, superheater elements, and the inside of the smokebox. These cinders, if large enough, can set fires along the railroad right of way. The figure above illustrates a Gas Producer Combustion System or GPCS firebox of the same size and layout as the conventional firebox. The fire grate is changed from a traditional “finger-style” to a grate with smaller air openings, which reduces the amount of primary air flowing through the grate / fuel to about 30%. For proper GPCS function, the grates must ensure even air flow through the firebed. A number of secondary air admission ducts must also be installed through the walls of the firebox. These can be located along the sides, back, top, and/or front of the firebox. These ducts are sized to admit the remaining 70% of the air needed to completely burn the fuel. This major reduction in the volume and consequently speed of primary air being sucked through the fire greatly eliminates unburned fuel particle carryover and the sand-blasting effect on the inside of the boiler as compared to traditionally-fired steam locomotives. In addition, the lower level of fuel carry over and near-complete combustion of the fuel significantly increases the furnace efficiency of the firebox, evidenced through the virtual elimination of “smoke” from the smokestack. The final part of the GPCS conversion is the addition of dispersion tubes installed under the grates to admit steam to the fire. Three to four percent of the exhaust steam from the locomotive’s pistons and various other steam-powered accessories is diverted for this purpose. This steam serves two purposes 1) keeping the fire below the ash fusion temperature, preventing clinker and 2) providing a source of water in the gasification reaction which is converted to gaseous hydrogen and methane in the firebed. These and other chemical reactions necessitate maintaining a much deeper firebed than in a conventional firebox, typically fifteen pieces of fuel deep. This steam must be well mixed with the primary air to ensure proper GPCS operation. The key to drawing enough draft through the GPCS, however, is an efficient blast nozzle and stack arrangement in the smokebox of the modern steam locomotive. Traditionally, very little thought was given to the design and arrangement of these systems, aside from simply making sure that a blast of steam went through a "petticoat" pipe, creating a vacuum in the smokebox. The aforementioned Kylpor, Lempor & Lemprex exhausts are all derivations of a similar principal: allow steam to merge in a high-volume passage, then route it through a "de Laval" nozzle, not dissimilar from a rocket engine which is designed in tandem with a refined stack. This combination minimizes back pressure and ensures a blast velocity through the stack that can exceed Mach 1.